Several centimetres of snow have fallen in London and forecasters have warned up to 5cm (2in) more could fall throughout the day. Transport for London (TfL) said it had "well-prepared cold-weather plans" following a severe weather warning. 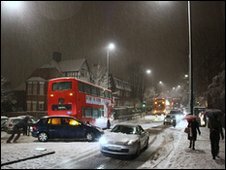 In Harrow, north-west London, 58 schools were closed and 130 council-run transport routes for schoolchildren and vulnerable adults were cancelled. Roads have escaped serious problems but there were delays at Heathrow Airport. Some 3cm (1.2in) of snow has fallen at Heathrow where a number of flights were delayed and 73 departures were cancelled. Passengers are advised to contact their airline to check on services. Four Eurostar services between St Pancras International and Brussels and Paris were cancelled. 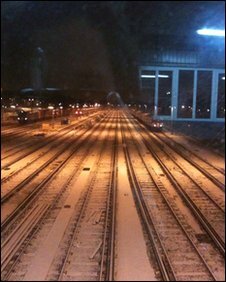 Sections of the Northern and Piccadilly Lines were suspended for a time due to the snow. National Rail Enquiries has set up a dedicated telephone hotline to provide updated information about rail services. The number is 08453 017641. A Metropolitan Police spokesman said: "There have been absolutely no incidents that we have been made aware of - it's been very quiet. "There has been nothing that you could relate to the snow." Continued light snow was expected in London throughout Wednesday. Pedestrians have been warned that it could turn very slippery. 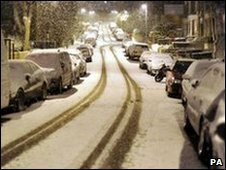 Temperatures will plummet below freezing overnight, possibly causing the top layer of snow to freeze into ice, BBC London forecasters cautioned. Mayor of London Boris Johnson said: "The gritters have been in action all over London but if there is a mega-dump I would ask people to avoid using cars and check the latest information before leaving home. "I would also urge Londoners to consider neighbours during this incredible spell of cold weather. "If you know someone elderly near you who may be struggling it would be most kind-hearted to check they are OK."